“Wolves” Play Out Today – “A Glorious Christmas Show”? Russ Tunney, Artistic Director of The Nuffield Theatre and long time Aiken admirer has adapted and premiered a gloriously funny and faithful stage version of Joan Aiken’s classic children’s book The Wolves of Willoughby Chase which is just celebrating its 50th Anniversary. The adaptation is published today by Nick Hern Books in a practical edition with performance notes and background information, and lends itself usefully to a cast of anything from five incredibly active quick change artists to a large cast and possibly even a chorus of children, with music and songs and plenty of laughs. Using all the tongue in cheek humour of the original story and its gothic thrills and adventures, Russ has also added some ‘more than Aiken’ touches of his own – including the deliciously ridiculous ‘Cheese Alphabet’ recited by the hapless starving orphans, including our two wretched heroines, in the dreadful Blastburn School run by beastly Mrs Brisket. advanced literacy: The Cheese Alphabet! 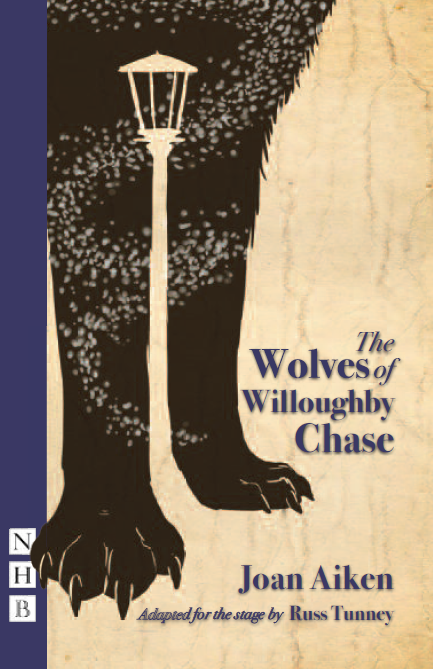 “The Wolves of Willoughby Chase has never been adapted for the stage before, according to Forest Forge artistic director Kirstie Davis, and I can’t think why not. Russ Tunney’s script (the show is a collaboration with the Nuffield Theatre where Tunney is associatedirector) blends melodrama, comedy, adventure and a little spookiness interwoven with songs and dances. Into the mix goes Rebecca Applin’s atmospheric music and Helen Stewart’s sloping set of panelled walls and jagged floorboards, plus Forest Forge’s trademarks of multi-function set and actors nipping in and out of costume and character at high speed. Davis weaves it all into a glorious snuggle down and enjoy Christmas present of a production that will charm children and adults alike. As the young heroines, Clare Fraenkel’s bright-eyed, feisty Bonnie and Julie Rose Smith’s timid Sylvia are enchanting without being irritating – which says a lot. Michael Cole,Michael Magnet and Thomas Gilbey play everyone else from sinister Miss Slighcarp and her shifty sidekick to trusty Simon and coarse Mrs Brisket, with Cole’s wretched workhouse girl a particular gem. And it has wolves of course….! This entry was tagged Joan Aiken's Wolves stage version, Nick Hern Plays, Russ Tunney adaptation Wolves of Willoughby Chase. Bookmark the permalink. From the magnificent trompe-l’oeil cover this looks fascinating–very tempted to get the book of the play of the book! It is a wonderfully racy read – and yes isn’t that a great cover. All in all a thing of joy! I’m chuffed to say we’re producing the amateur première at Progress Theatre in Reading, in January 2014 (provided nobody else hops in first!!). Brilliant, and lovely poster too, you’ll have such fun…!